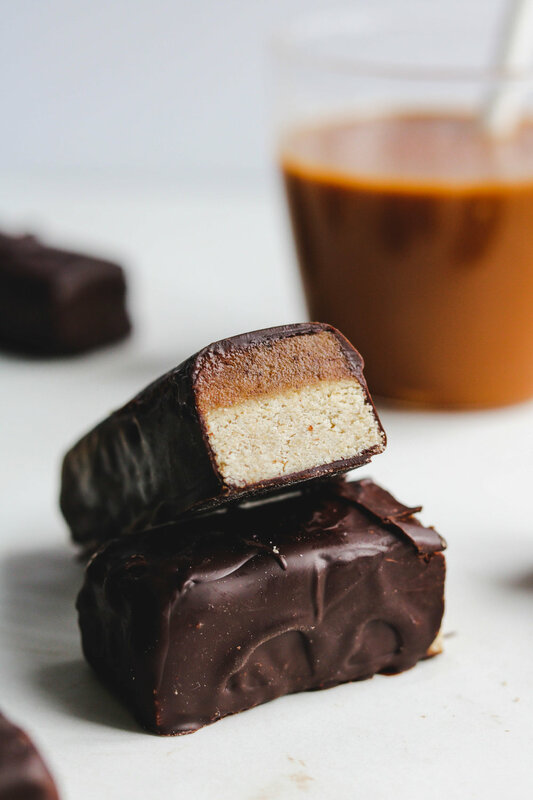 These Brown Butter Caramel Twix Bars are a delectable twist on the traditional caramel biscuit bar. Made with only 8 ingredients! Vegan & gluten free, with a nut-free option. Remember when I said expect some delicious desserts using the browned coconut butter recipe I shared yesterday? Well, heres my very first one: BROWNED BUTTER CARAMEL TWIX BARS. Yes, this is now a thing. Twix bars were my FAVOURITE chocolate bar growing up. Something about the buttery crunchy biscuit, with the caramel-y filling all covered in a melty milk chocolate… what’s there not to love? So what are these Brown Butter Caramel Twix Bars Made out of? Just 8 ingredients! and a bit of vanilla + salt for an added touch! Perhaps this is the adult version of the Twix Bars I grew up on. Brown butter caramel has a elegant and sophisticated nutty flavour that is absolutely incredible. The biscuit is buttery, yet has a nice crispy snack thanks to the coconut flour. And I am definitely team dark chocolate, so thats what I coated it with to complete these Twix! Share these with your friends and family, they won’t even know it’s made with healthier ingredients! Every time I tell my family, friends and boyfriend that I made something with “vegan-ish” ingredients, they’re always in shock 😂! I’m already thinking about the next homemade candy bar to recreate… Snickers? Mars? Kit Kats? Oh Henry Bars? COFFEE CRISP?! Which one would you guys like to see next? If you love all things caramel & chocolate, here’s some more delicious healthier chocolate recipes to make! 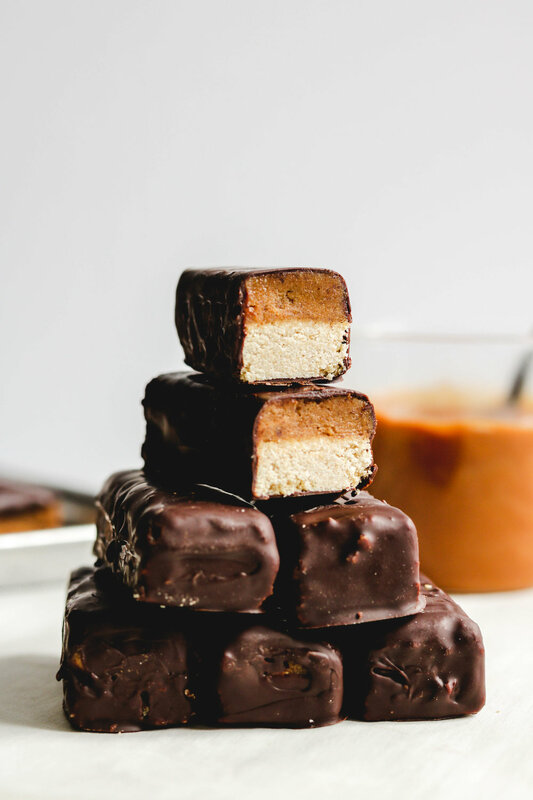 If you recreate these Brown Butter Caramel Twix Bars please share it and let me know what you think by tagging me on Instagram @lisakitahara, I love seeing all of your tasty recreations! Mix the melted coconut butter, maplesyrup and vanilla together until combined. THen add in the almond flour and 3 tbsp of coconut flour. As your mixing, it it feels "too wet", add in one more tbsp of coconut flour. Press into a lined 6x6 inch baking pan and bake for 12-15 mins, or untilt he edges are lightly browned. Once out of the oven, allow it to cool for atleast 10 minutes. For the caramel, add the dates, melted browned coconut butter, coconut cream, vanilla and salt into a blender and blend until smooth. Scrape down the sides if needed. Pour the caramel over the biscuit and spread evenly using the back of a spatula. Place into the freezer for atleast 1 hour. Once out of the freezer, slice into 12 bars. Place them back into the freezer to firm up for 10 minutes. In the meantime, melt down your chocolate coating. Line a tray with parchment paper. Take the bars out of the freezer. Dip each bar into the chocolate coating using a fork and place onto the lined baking tray. The chocolate will harden quickly if your bars are still cold. You can enjoy them right away or store them in a air tight container for up to 1 week in the fridge. FOR NUT-FREE, OAT FLOUR OPTION: 3/4 c oat flour, 2-3 tbsp coconut flour, 1/4 c + 2 tbsp coconut butter, 1/4 c maple syrup. This biscuit is a bit more difficult to cut through when out of the freezer (but it still tastes just as good!!). I recommend cutting the biscuit when out of the oven, placing it back into the baking pan and then covering it with caramel. Then, cut each slice where you’ve already cut the biscuit. When pressing the biscuit into the pan, use a flat top potato masher OR a measuring cup to evenly spread the dough out. For the chocolate coating, go for a higher cocoa % as it will be much easier to coat and yield a thinner coating. My favourite chocolate to use for this is this or this one by Alter Eco. If using semi-sweet chocolate, add in 1 tsp of coconut oil to thin it out.